We are extremely excited about our brand new website – with a host of new products and branding ideas to help inspire our customers! 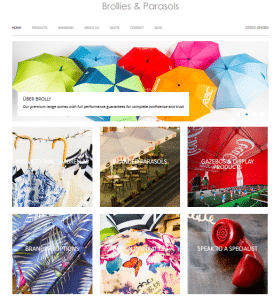 You should find it very user friendly and easy-to-browse but also it hopefully reflects the importance of design, creativity and your branding when it comes to promotional umbrellas, branded parasols and printed gazebos & display products such as flags. We want to make your end product not only practical, durable, long lasting and high quality, but also beautiful and designed to coordinate seamlessly with your branding. We are still all about quality, we use the best materials and technology to ensure that your branded umbrellas, promotional parasols and printed gazebos that will stand the test of time and carry your logo for a long period. Best of all we have ensured that our prices remain low and we are confident that we can beat any competitor’s prices based on the same quality of product. We have low overheads so we can pass on savings to our customers. Why not get in contact with us and we can put some quotes together so you can see for yourself!